The Book of Mormon: Fact or Fiction? My name is Jody Ormond Morris. Like so many other names, it tells a story. Mine is of a fifth-generation Mormon who was converted to Christianity and is now serving the Lord with his family as a pastor in the OPC. I’d like to share my story with you. Ah! The majestic music of the Mormon Tabernacle Choir! We love their music. We are almost ready to embrace them. 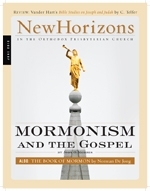 We are almost ready to remove the Mormons from our list of cults and welcome them into the Christian camp. In 1925 a fresh face appeared in the Presbyterian Church U.S.A. John J. DeWaard had recently graduated from Princeton Seminary and was being examined for ordination by the Presbytery of Milwaukee. Rather than continue his studies at Princeton, DeWaard pursued a call to the First Presbyterian Church in Cedar Grove, Wisconsin. Dr. Geerhardus Vos had recommended his young student, and the congregation in Cedar Grove was eager for his arrival. It is by strict theological logic, that the Creed confesses faith in the Holy Spirit before proceeding to the church and that it speaks of the church before mentioning personal salvation ... and it is in the church, through its ministry and fellowship, that personal salvation ordinarily comes to be enjoyed.